Published: Apr 8, 2016 to ? Kasumi Toyama has always been captivated by the "beat of the stars." Since then, she's been searching for something... a spark that'll excite and thrill her! Following a trail of star-shaped stickers, she soon stumbles upon a Random Star guitar at her school mate's house! Could this mark the start of something amazing? A sparkling, heart-racing high school life begins for Kasumi as she decides to form a band! BanG Dream! has been published in English by Shogakukan Asia since March 2017. Alternative version: BanG Dream! : Star Beat, BanG Dream! 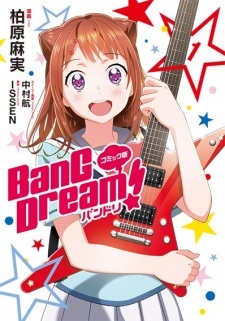 Other: BanG Dream! Yonkoma Bandori!